Damien Gilley is an artist and educator based in Portland, Oregon. 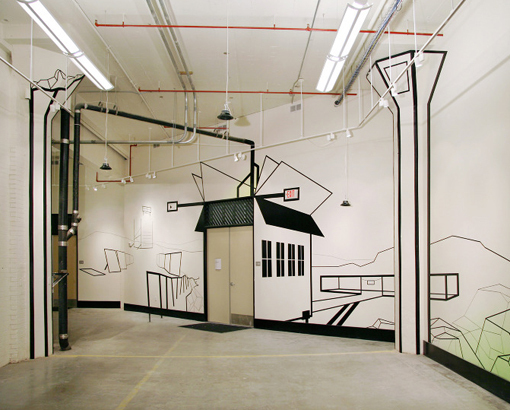 His work explores hidden urban structures through perceptual installations that combine drawing and sculptural approaches. Gilley's work has been exhibited nationally and internationally at venues including Tetem Kunstruimte (Enschede, Netherlands), EastWestProject (Berlin, DE), Las Vegas Art Museum, Arthouse (Austin), Suyama Space (Seattle), the Art Museum of South Texas (Corpus Christi), and in Portland at Rocksbox, Linfield College, Wieden+Kennedy, the American Institute of Architects, the Pacific Northwest College of Art, and the Portland 2010 Biennial, among others. His work has been reviewed by Artforum.com, the Oregonian, Willamette Week, Portland Mercury, Las Vegas Review Journal, the Austin Chronicle, and New American Paintings. He has received multiple grants from the Regional Arts & Culture Council, and Individual Artist Fellowship from the Oregon Arts Commission.